We provide corporate and investor clients market analyses, growth strategies and due diligence services by examining internal and external drivers to fully understand a business and the risks and opportunities it faces on its path forward for growth. Our team combines deep knowledge of healthcare policy with unparalleled primary research capability to quickly inform a nuanced market perspective that provides our clients with customer demand trends, competitive landscape and dynamics, company capability assessments, market sizing and growth estimation, growth opportunity assessments and prioritization, and strategy implementation roadmap development. 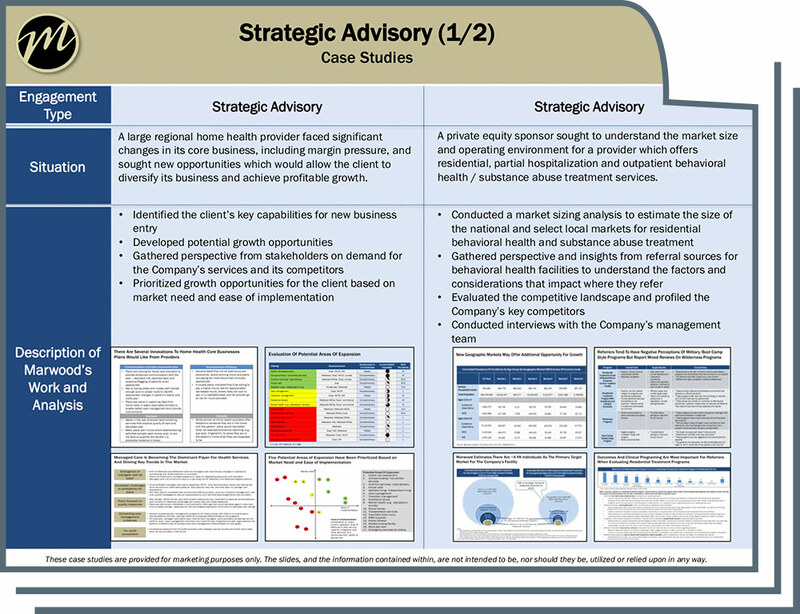 Our Strategic Advisory team is comprised of veterans of large consultancies with a deep desire to deliver actionable advice to our corporate and investor clients.